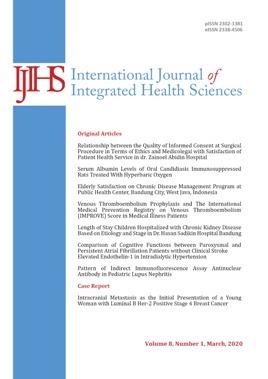 International Journal of Integrated Health Sciences (IJIHS) is a peer-review journal which publishes original articles, medical research, clinical research and case report. This journal is supported by Faculty of Medicine Universitas Padjadjaran and was launched on September 22nd 2012 and firstly published on July 2013. The first and second publications in 2013 and 2014 were published annually. In 2015 IJIHS published twice in a year, March and September. IJIHS had online published version starting with Vol. 1 No. 1 with ISSN 2302-1381 of its print version and an online version from 2338-4506 in accordance with the policy of LIPI. IJIHS publishes minimum 8 manuscripts in each publication. Since 2016, IJIHS has been using Open Journal System requiring all writers to register in advance before they are allowed to upload the manuscript as well as the author(s) input the manuscript online. Afterwards, the editors, peer reviewers, and author(s) can monitor the manuscript processing by OJS or email.